Death Note Wallpaper: Do You Think I Am Strange? 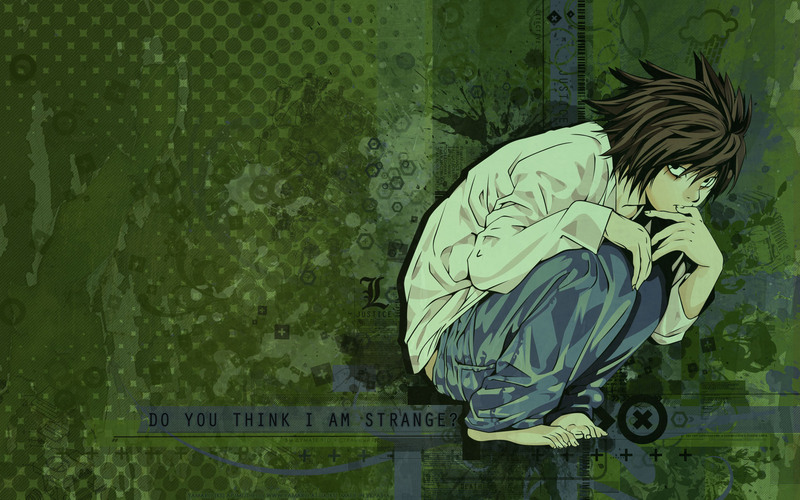 Minitokyo »	Death Note Wallpapers » Death Note Wallpaper: Do You Think I Am Strange? In some way it was a request - some green wall with L. So thats why such color theme. There are so little green death note walls. So it was interesting for me to make it. Title T_T I couldn't choose good one..
dude...L looks too good here. Yay Ilove death note! and L is the best character. He eats like a pig but he stays so skinny, lol. WOW! L he's so cute! I love the wallapper of deathnote and L is very strong like caracther. Haha, awesome wallpaper. Go L! DO I THINK UR STRANGE?! Strange? no man i think ur hot! He is very strange but an awesome character to watch too! Oooh :) awesome wallpaper :) thank you!